Even if you scour every inch of the Smithsonian’s National Museum of American History, you won’t locate the anonymous gift given to the institution by an unknown donor because it’s not currently on display. But if you’re curious, you might ask a curator to let you see the cast aluminum electric fry pan that represented that era’s most sophisticated appliance back in 1972. Yes, electric skillets have been around for nearly half a century. The electric skillet in the Smithsonian is yellow—-an extremely popular appliance color in the 1970s—-and the dome cover is large enough to prepare a side of beef with room left over for potatoes and carrots. A rare treasure? It was back in the day, so if you fast forward to today’s electric skillet models, you could find some of them to be so sophisticated, perhaps they will share display space within the museum’s Domestic Furnishings collection some day. Will those modern-day models be Osters? Hard to say. But Oster has been around long enough to be considered a national treasure, so it's understandable why you're limiting your search to electric frying pans made by this company alone. 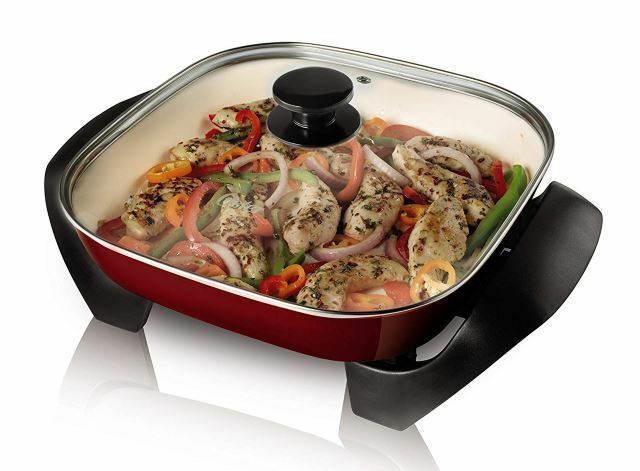 Why Choose an Oster Electric Frying Pan? John Oster was only 15 when he emigrated to the U.S., but he quickly established himself as a tool and die maker before moving from Chicago to Racine, Wisconsin. He and three associates became so skilled at producing blades for hair clippers that they set up shop in 1921 and never looked back. Never one to run out of innovative ideas, Oster bought patents for a number of products, none of which had anything to do with hair. He also bred cattle and remained such a legend, he was inducted into the Barber Hall of Fame in 1972—the exact year the aforementioned yellow Smithsonian relic was first introduced to the housewares market. Before producing household appliances, Oster made motors for military airplanes, buying the Stevens Electric Company in 1946. With the name, he became the owner of products Stevens had designed, including a liquefying blender which unleashed a long list of products that ultimately included electric skillets. An odd journey? Not for John Oster whose state-of-the-art products continue to make life easier for cooks to this day! They’re big and they’re small. Round and square. Colors run the gamut from black to apple red. If anything, today’s electric frying pan comes in so many permutations, it's smart to assess your needs before you peruse our Oster electric skillet reviews so when you shop, you find exactly the one that's right for you. Choose a size. If storage is an issue, measure the area you can dedicate to your appliance before buying. Determine your price range. 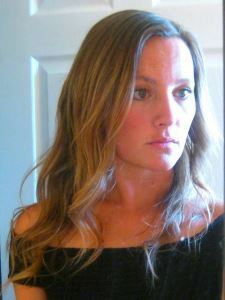 Are you looking for versatility or is simplicity your buying ethos? What do you cook most often? Will you prepare food for crowds or just for yourself? Do you prefer a specific skillet shape? Square and oblong models hold more food than circular ones. Will you deep fry food? If so, your skillet must be capable of operating at temperatures over 350 degrees F.
Are soups and stews family favorites? The higher the sides the better your ability to prepare these dishes. Does the model you’re considering have a heat-resistant handle? These are safer and more convenient. Are you partial to stainless steel or aluminum; non-stick coating or not? Will a solid metal lid suffice, or do you prefer a glass lid that allows you to monitor your foods? Does the skillet have a steam vent? Without one, liquids could boil over the sides and make a mess. How much effort will be involved in cleaning your skillet; must it be dishwasher friendly? Does the skillet you like best come with a repair and/or replacement warranty that covers you if you're not happy with your purchase? These appliances can fry, sauté, brown, grill, steam and bake. Ideal for camping trips where electrical outlets are available. They keep food perpetually warm and can replace chafing dishes when hosting crowds. They can be lifesavers for students living in dorms with no kitchen access. When the weather gets hot, you don't have to heat your oven to prepare dishes. Temperature gauges/probes keep foods at optimal recipe temperatures while they cook. Temperature dial on Oster models has both Fahrenheit and Celsius readings. Folks happy to use a regular frying pan or griddle for cooking tasks may find these appliances superfluous. Do you have limited storage room? Even small electric frying pans can hog cabinet space to stow the skillet, dome lid and power attachments. Cheap electric frying pans can result in temperature fluctuations or inconsistent temperature maintenance during the cooking process. There are plenty of electric frying pans on today’s market that will set you back some serious dollars, but you can count on Oster to keep prices in the affordable range, so they don’t bust a family’s budget. Read enough Oster duraceramic electric skillet reviews and you’ll conclude that this type of surface is both practical and efficient. Whether you need a larger surface to prepare meals for crowds or a small one designed to conserve space and energy, you should find what you seek in this collection. Although we’re featuring affordable models in this review--you’re going to find plenty to love about the branded appliances profiled below. Sleek, black and featuring a 16- x 12-inch stainless steel body, this affordable electric skillet serves a multitude of purposes while taking up relatively little room on counter tops or in cabinets. The tempered glass lid will trap moisture and heat to accelerate cooking time and there’s a temperature probe control that’s easy to set and adjust before or during the cooking process. Cool-touch handles are a boon to cooks who can forget to grab potholders and mitts while hustling to get a meal on the table. Get all the features you need at a price that won’t empty your wallet. Dishwasher safe, you don’t have to hand wash because the probe is removable. Can you put a price on those cool-touch handles? Non-stick surface means you can cut back on adding fats and oils to your recipes. There have been complaints about the non-stick coating wearing off. Some users complain of uneven heating. 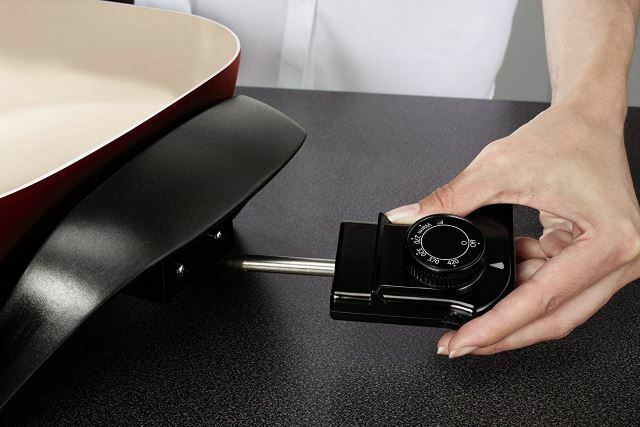 Small but mighty, this black, 12-inch square electric appliance comes with a full complement of Oster’s bells and whistles: a tempered glass lid, adjustable temperature control probe, non-stick interior and exterior surfaces for fast clean-up and the brand’s signature cool-touch handles that help cooks avoid accidental burns. Both the skillet and the lid are dishwasher safe, but remove the probe before you toss it in. This product is a lifesaver for folks living in small quarters. Heats up quickly and cooks a variety of dishes. Takes less storage space than the 16". Coated exterior and interior walls can easily be cleaned by hand or by dishwasher. Cool-touch handles safeguard hands and fingers from being burned. Despite the smaller size, this model could cost more than the aforementioned 12- x 16-inch model, so it's not your best financial option. Skillet surface may not heat up evenly, say owners complaining to the manufacturer. If you pride yourself on a stylish kitchen and have the room to leave it out and wait for compliments, this 12-inch candy apple red electric frying pan will do the trick. There’s more to love: This stylish appliance is also one of the most affordable options in this review. No worries about cooking surfaces because the PTFE- and PFOA-free ceramic coating won't flake or peel. There’s a steam vent in the tempered glass lid to displace pressure and the cool-touch handles are stylish and practical. 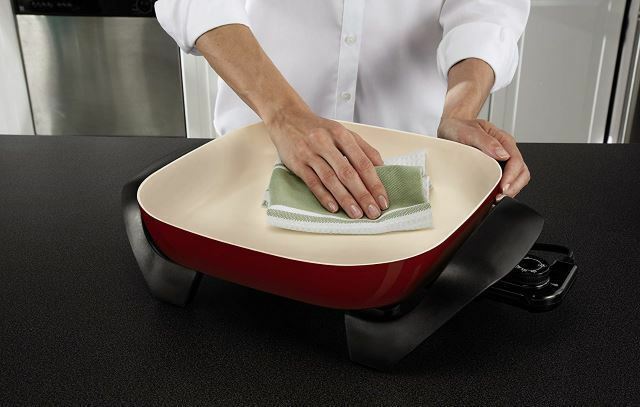 Cleanup is fairly easy no matter what you’ve prepared in this electric skillet. A little bit of baking soda gets rid of stubborn stains. 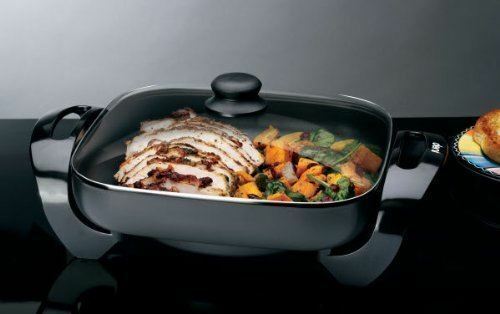 Titanium-infused DuraCeramic nonstick coating lasts 4-times longer than other types of non-stick coatings according to the manufacturer. Cooks up to 20-percent faster for time and energy savings. Some reports of handles coming loose due to hardware issues. Color may not work with your kitchen. The fact that it cannot be cleaned in the dishwasher may turn some users off. 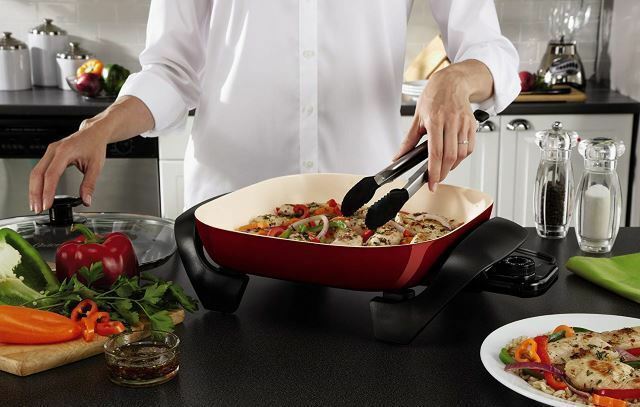 Have you identified the Oster electric skillet that’s right for you? If you’re a fan of bright colors and never met a red appliance you couldn’t embrace, the Titanium Infused DuraCeramic Electric Skillet is right up your alley. 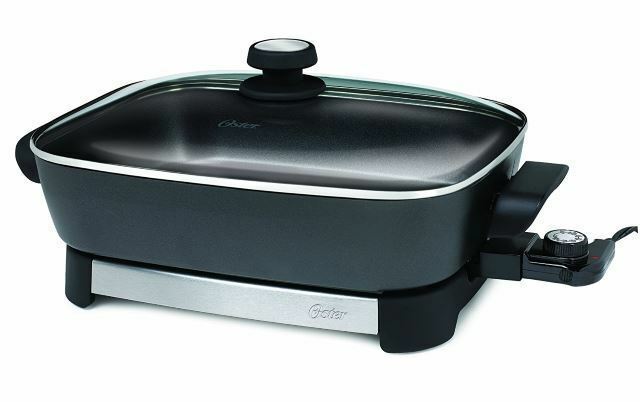 On the other hand, if space concerns and a no-frills appliance is your idea of the perfect electric frying pan, your choice is clear with Oster’s tidy 12-incher. Of course, the first model in this trio checks off boxes cited earlier in this article: it’s a great substitute for a plethora of other appliances, gives you precise cooking temperatures on a larger surface and comes with desired safety features. You’ll find plenty to like about the glass lid that gives you a peek into your recipe’s progress.